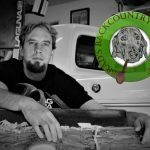 Ever wonder how to repair wicker furniture? 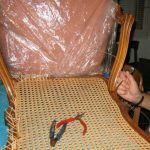 Through Cathryn’s article here and its step-by-step photos and instruction, you will get a glimpse of how wicker furniture repairs and restorations are completed. 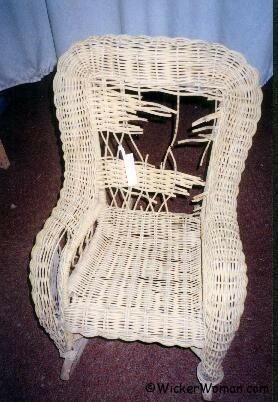 This cute little family heirloom Victorian child’s wicker rocker was in dire need of repair, and the customer wanted it restored for his granddaughter to use. Some of the damage to the spokes and weavers were very apparent, but the major damages were not really obvious until observed under close scrutiny. Many spokes (ribs), in the rolled arms, back and seat were broken completely and needed to be replaced. Because of this, I also had to replace a great deal of the weaver strands, too. However, the rocker was an excellent quality piece circa 1890s-1910. 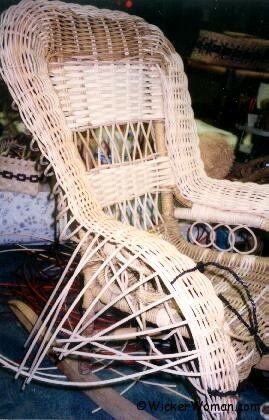 It was woven with rattan reed on a hardwood, steam-bent framework that was still in perfect shape. 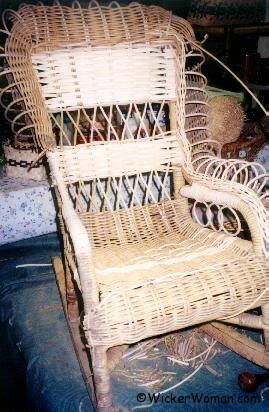 The rocker was worth every hour and every dollar it cost to restore this precious family heirloom to its former glory! 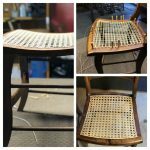 This little antique wicker rocker still had its original yellow-beige paint, which the customer was going to have color-matched by a paint store and then repaint himself after my repairs were complete. Had this piece originally been stained a walnut or other dark color instead of being painted, I would have substituted smoked rattan reed for the natural reed I used in the repairs. Smoked reed makes for a very easy color match with dark stained wicker. Since smoked reed is already a dark walnut color, it only needs a couple coats of varnish or one light coat of stain to blend in with the original materials where patches or replacements were made. As it was, I used various round, half-round and flat-oval sizes of natural rattan reed. These imported raw material supplies, instruction books and tools are easily purchased from any of the cane and basket suppliers on my website, since I am not in the business of selling materials to the public. When my customer saw his little family heirloom wicker rocker all repaired and restored he was delighted and will enjoy this treasure for many years to come! Almost all spokes or ribs in the entire serpentine rolled arms were either broken or cracked and several spokes in the back and seat were also broken. 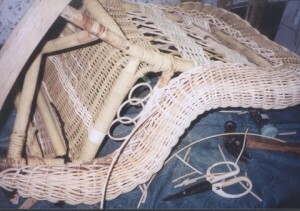 Many, many areas throughout the rocker needed weavers replaced, also. Assessing the damaged areas and replacing only as much as necessary is the first step in each repair job. Then comes the removal of all broken spokes and weavers, and eventually replacement and patching begins. Holes in the wooden arm framework where the spokes were inserted must be drilled out to clear any remaining spoke material and glue. The rattan reed used in wicker furniture restoration of this kind is imported from countries such as Southeast Asia, China, the Philippines and Malaysia. It can be purchased through most cane and basket supply companies here in the States. All new reed must be soaked in water for about 20 minutes so it becomes pliable and doesn’t break during use. As you can see here, the weaving has been completed on the back and seat and now I’m working on the rolled, serpentine arm spoke replacement. Before the weaving on the rolled arm can take place, the wooden framework must be wrapped first. Here I used 11/64″ flat-oval reed, and the chain loops under the arms were replaced with #6 round reed. In this picture, replacement of the #6 round reed spokes or ribs in the arms has begun. I use yellow carpenter’s glue to hold the reed spokes after drilling out any remaining glue in the armholes, and also use the same glue for the frame wrappings. In this picture you’ll see that the spokes on the left arm and back were all replaced, making sure to follow the exact curvature of the original. The weaving with 3/16″ half-round reed is completed and the #6 round reed loops underneath the arms have also been replaced. Beginning the right arm reconstruction is also featured in this photo. All areas of the serpentine rolled arms and back are now completed, and I’m just finishing up on the underside of the right arm. The round reed spokes have been tacked to the hardwood framework underneath and weaving is nearly finished. Leg wrappings are still to be done, but the project is coming along nicely. 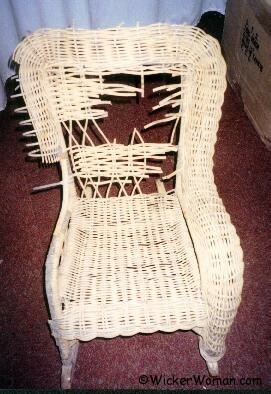 Child’s Wicker Rocker Repairs Completed! All light areas on the rocker are where I replaced damaged or broken materials, and will of course be invisible after the rocker is repainted. Any hairy fibers that might have surfaced during the weaving can be singed off using a low-flame blow torch or lighter when the reed is still damp. 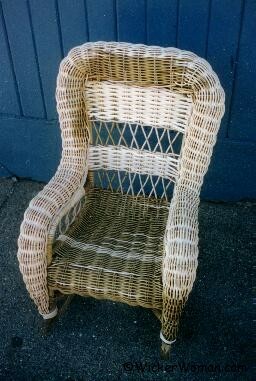 You certainly don’t want this wicker gem going up in smoke! 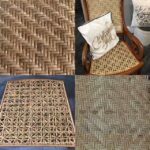 Painting wicker furniture includes using two thinned coats of wood primer, applied by using either a compressor sprayer or a paint brush. When that has thoroughly dried, then the application of two light coats of oil-based, indoor/outdoor house paint. Latex paint can also be used, but I’ve gotten better results myself using oil-base paint instead of Latex, seems to flex more readily and has a more durable finish. Apply the paint carefully and lightly so you don’t get runs and globs of paint on this fine, intricate work and cover up all the detail. 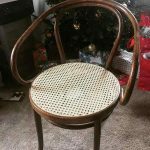 Allow the paint to dry several days to a week so it dries thoroughly before it’s put into use for successful wicker restoration project! 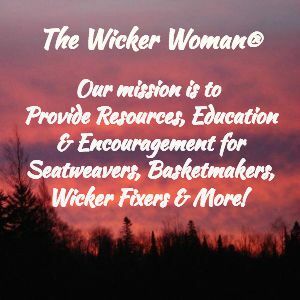 Thank you so much for visiting WickerWoman.com and we hope you’ve found this article on “How-to Repair a Child’s Wicker Rocker” helpful and will come back often to see further updates. Please Share This! article with your friends, use the handy social buttons below.